These fungi are saprobic or parasitic. 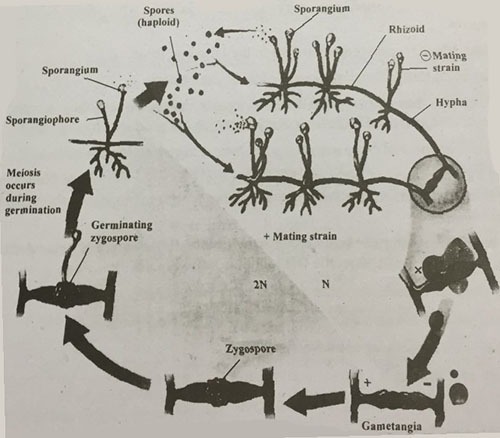 The life cycle of rhizopus is mentioned in fig 1.1. They are found on a wide variety of organic substrates, including mature fruits and vegetables, feces, jellies, syrups, leather, bread, peanuts and tobacco. Some Rhizopus species are agents of human zygomycosis (fungal infection) and can be fatal. Rhizopus reproduces by vegetative, asexual and sexual methods by spores. The asexual spores are produced inside the sporangium and are genetically identical to their parent. In Rhizopus, the sporangia are supported by a large columella, and the sporangiophores arise among distinctive rhizoids. Dark zygospores are produced after two compatible mycelia fuse during sexual reproduction producing colonies that may be genetically different from their parents. The hyphae are unseptate, coenocytic and loosely arranged. It is by spore formation which are produced in the sporangia. Sexual reproduction involves plasmogamy, karyogamy and meiosis. During sexual reproduction, zygote is formed directly by the fusion of hyphae called gametangia/gametes (conjugation). Karyogamy immediately follows plasmogamy. The zygote forms temporary, dormant, thick walled resistant structure called zygospore. Therefore the name of this group is Zygomycetes. The zygospore germinates under favorable conditions. Meiosis takes place when the zygospore germinates and haploid spores are produced. Spores on germination produce new mycelium. Example: Rhizopus is very common example. It grows on the moist bread and fruit etc and spoils them.